An enterprise-level user can select configurations by following the process. For more information about the instance types, see instance generations and type families. A balanced CPU to memory ratio is required to meet the application resource requirements in most scenarios. High packet forwarding rate is required. 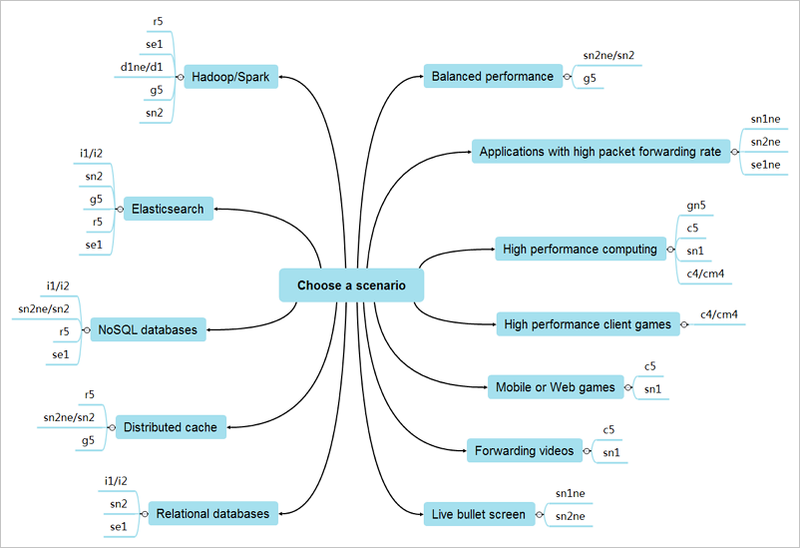 You can select a more reasonable computing capacity to memory resource ratio based on the specific scenarios. Many computing resources are required. GPU parallel computing and a high clock speed are typical applications in this scenario. Your services require a high-frequency processor to carry more users. Therefore, a high clock speed is required in this scenario. Many computing resources are required for this scenario. A CPU to memory ratio of 1:2 can help achieve optimal cost performance of computing resources. High packet forwarding rate is required for this scenario. You can select a more reasonable computing capacity to memory resource ratio based on the specific scenarios. In this scenario, SSD cloud disks or higher-performance NVMe SSD local disks are required to provide higher IOPS capability and a low read latency. The CPU to memory ratio is balanced (1:4) or the memory proportion is larger (1:8). In this scenario, a balanced CPU to memory ratio (1:4) or a higher memory proportion (1:8), and stable computing performance are required. In this scenario, SSD cloud disks or higher-performance NVMe SSD local disks are required to provide higher IOPS capacity and a low read latency. The CPU to memory ratio is balanced (1:4) or the memory proportion is larger (1:8). Data nodes require a high disk throughput, high network throughput, and balanced CPU to memory ratio. Computing nodes focus more on the computing performance, network bandwidth, and CPU to memory ratio. In this scenario, a high performance Nvidia GPU computing processor is required, and the memory size must be at least twice the video memory. In this scenario, a high performance GPU computing processor or a high performance CPU is required for encoding and decoding. In this scenario, a high performance GPU computing processor is required for rendering.